Adopted children are often unintentionally very hurt by their friends asking them awkward and personal questions using language that appears unkind. They recognise that their friends mean well, but they wish they would think and learn more about adoption before asking questions. However, many families don't come across adoption and as a result, neither parents nor children are prepared for how to address the issues. Schools also often have only the occasional adopted child and teachers don't prepare other kids to understand these issues. A review of online sites, books and other materials indicated that there was simply nothing available for parents or teachers wanting to help children understand adoption in a quick and easy way. 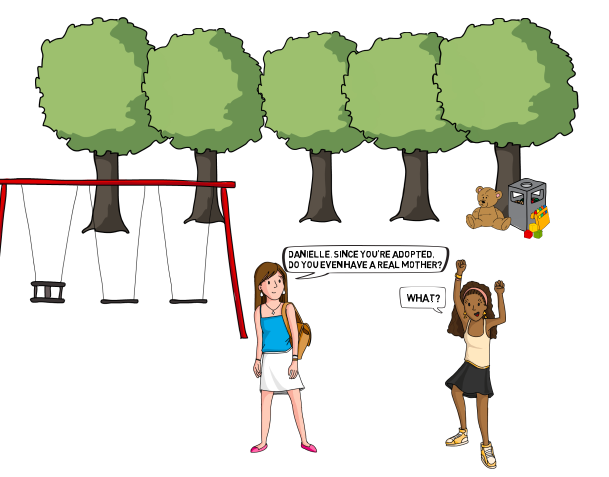 These short 3 minute videos are designed to be used by teachers and parents to help explain to children the appropriate language to use when asking their adopted friends questions about adoption. The scripts for these videos were developed in conjunction with teachers, school counsellors, adopted children and adoptive parents. The series of six videos are short and simple, with a recurring group of characters in order to explain complex issues in a fun and easy way. The target age for the materials is children aged 7-12, although they can be used with much younger children if read aloud. The videos are designed to be shown and discussed. It is easy to pause them and have a class discuss the issues and then see how they are resolved. The scripts for the videos are also available to be downloaded and can be used as teaching tools.